A prime observation is that gearbox failures frequently initiate in the bearings rather than the gears themselves. This paper is based on the many gear problems investigated by Neale Consulting Engineers Ltd (NCEL) over the last 30 years. Examples include misalignment caused by elastic deflections, resonant vibrations, transient thermal expansion effects during start-up, external contamination due to orientation, and breathing / sealing arrangements. A review of all gear and gearbox failures investigated by NCEL showed that the failure sequence frequently starts with a bearing, rather than a gear. Fig. 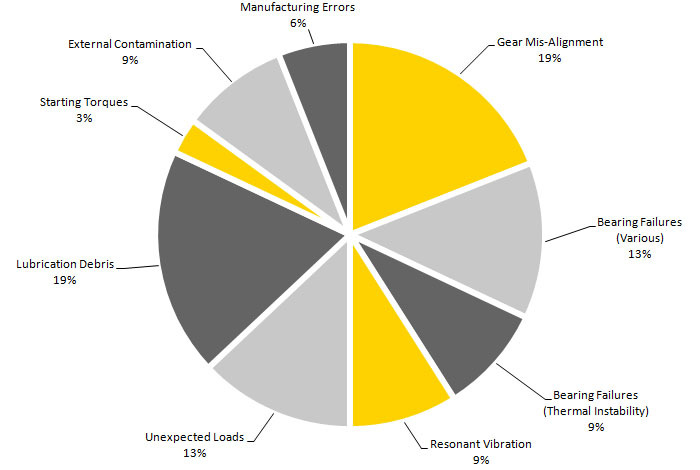 1 summarises the results, with bearings being the apparent root of about half of all gear failures. Figure 1. 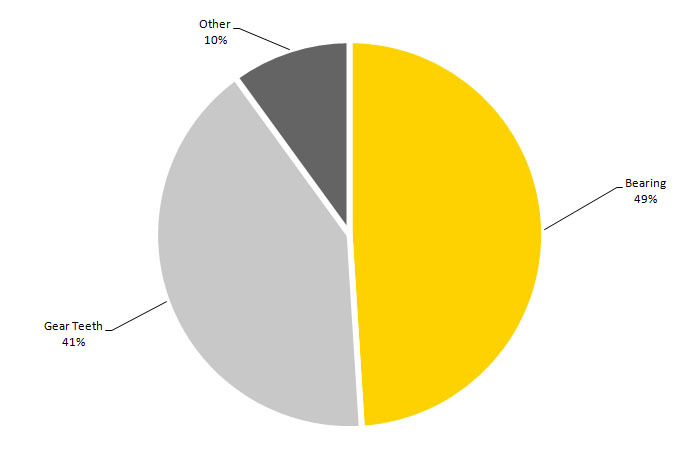 Shows distribution of gearbox failure root causes. This may at first sight seem surprising, since rolling bearings (used in the majority of gearboxes) seem to have a relatively easy job compared to the gears. The gears have substantial sliding in the tooth contact, and substantial bending stresses in the teeth. Rolling bearings have neither, just (nominally) pure rolling. However, rolling bearings operate under high contact (Hertzian) stresses, and are susceptible to the effects of small debris particles in the lubricant. These may well be the reasons why the bearings frequently suffer before the gears. Starting torque related failures (3%) are quite small, indicating that starting torque effects are in general well understood and allowed for by designers. Manufacturing errors (excluding design errors!) are also quite small, at 6%. There are many cases where a minor manufacturing error or deficiency has been found, but NCEL’s investigations have shown that this was of minor or zero significance in the failure. There is a tendency for users and manufacturers alike to identify a small manufacturing error and then correct it. Any subsequent improvement in life may then be attributed to the correction of this error, whereas the truth may be that the cure was due to some other aspect, of design, set-up, or operation, which happened to change at the same time. Generally, the gear design standards are conservative, and a manufacturing error has to be quite severe to be the prime cause of failure. Misalignment affects both gears and bearings, although some types of bearings (spherical roller bearings) are immune to it. 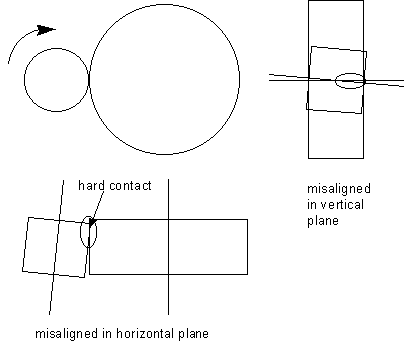 Misalignment is probably the most common single cause of failure. In gears it is exhibited as premature pitting at one end of the tooth. In bearings it may exhibit as pitting, or it may result in cage wear and failure. There are many causes of misalignment, both static (manufacturing or setting-up errors) and dynamic, due to elastic deflections of components under load, and also due to thermal expansion. On large gear systems where setting-up and alignment may be done during installation, it may be impractical to physically check that the shafts are parallel to the required accuracy. In such cases, blueing checks on the teeth are correctly regarded as the best way of confirming correct alignment. If the drive operates with torque in both directions, it is essential to check the tooth bedding for both directions. The reason for this is that it is quite feasible for the shafts to be misaligned in such a way as to give good tooth contact in one direction, but severe end-loading in the other direction. This is illustrated in Fig.3. There is a natural tendency to minimise the number of stages in a gearbox, and this sometimes results in very long and slender pinions, which are often made integral with the shaft. 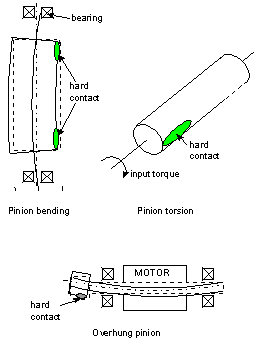 Such pinions can suffer from relatively large bending deflections, and also from torsional wind-up, as illustrated in Fig.4. With geared motors, to avoid use of couplings etc., it is common to mount the gearbox input pinion on the motor. This overhung pinion then may deflect substantially, causing misalignment at the input stage, also illustrated in Fig.4. 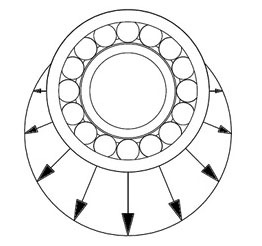 It is common to support shafts in a pair of spherical roller bearings as shown in Fig.5, one being fixed to carry axial loads, the other being free to float in its housing. 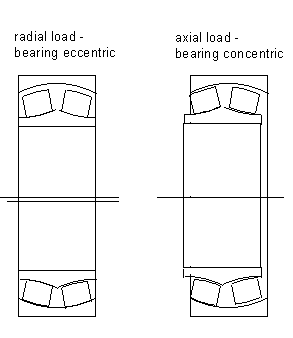 If the ratio of axial to radial load is greater than the “e” value of the bearing, then the fixed bearing will run approximately in the centre of its clearance circle. 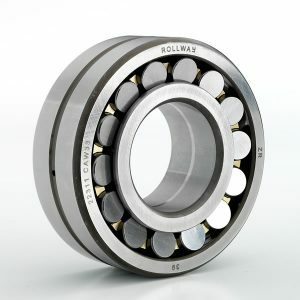 The free bearing will always run at the outside of its clearance circle. This results in a small but significant shaft misalignment. This can be compensated to some extent by careful design. However, it can be particularly severe for gearboxes where the output shaft has been modified to incorporate large bearings to support external loads. Misalignment effects tend to be more severe on larger units. This is because the required accuracy of mesh contact (or bearing alignment) does not vary substantially with size, whereas the difficulty of achieving it is greater with large units. Most small and medium sized gearboxes use rolling bearings, with plain bearings being used on very small sizes (for simplicity), and on very large sizes (for improved performance). However, for the vast majority of industrial gearboxes, rolling bearings are the appropriate choice. Rolling bearings have been found to be quite sensitive to various effects, including misalignment (not all types), debris, lubrication deficiencies, contamination, and vibration and shock. They are also susceptible to damage from excessive forces used during fitting of couplings etc. A particular problem occurs when designs of gearbox, which may have been designed mainly for horizontal shaft orientation, are used with vertical shafts. A typical problem which can arise is that any debris or contaminants accumulate in the bottom, and result in wear of the bottom bearings. Of course, as long as the oil remains clean, there is no problem, but this type of design is clearly sensitive to any external contamination, or even to the effects of the small amount of wear debris from gear teeth in normal operation. Where contamination is likely to occur, a substantial sump area below the bearings is highly desirable, where contamination can collect and do no harm. Units in storage or units in standby mode can suffer bearing damage due to vibration. This, in extreme cases, causes false brinelling of bearings. In less extreme cases it causes premature fatigue, which may be in patches at roller spacing. This topic could merit a paper in its own right. It is a mode of failure which is becoming more common on many classes of machinery, including gearboxes. It is very difficult to diagnose with certainty from examination of failed parts, because often all that remains is blackened, twisted bits of metal. This failure mode occurs when a large temperature difference builds up between the shaft inside a bearing and the housing surrounding the bearing. 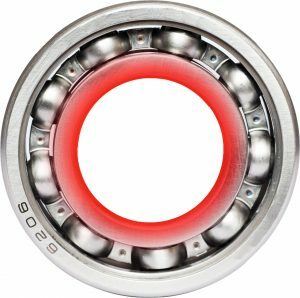 The differential thermal expansion causes the bearing to lose internal clearance and become pre-loaded. This results in increased heat generation which will increase the differential temperature. This is positive feedback which rapidly leads to thermal runaway and melt-down. The mechanism is classically associated with high speed shafts, and is most likely to occur soon after start-up. This is because the shaft has much less thermal mass than the housing, so during the warm-up period a differential temperature occurs naturally, perhaps building up to 30 degrees differential during the first 10 minutes of running, then dropping back to about 10 degrees as temperatures stabilise. Various features can make this form of failure more likely, including high speeds, rapid acceleration, hollow shafts, external heat conducted into the shaft, and many more. The failure may happen with a single ball or roller bearing, but is more common with a pair of locating bearings on a shaft, perhaps a pair of taper roller bearings in face-to-face configuration. With this set-up, both radial expansion of the shaft and axial expansion combine to reduce clearance and increase preload. Therefore this configuration is particularly prone to this problem. A better arrangement is back-to-back, as the radial and axial thermal expansions counteract each other. Even where two spherical roller bearings are used, with one free to slide in its housing, this mechanism can still occur. This is because the sliding bearing may jam in its housing, either due to corrosion, or due to relative thermal expansion during warm-up. As mentioned above, this mode classically occurs during an early life start-up, preferably in cold weather. However, it can still happen later in life, perhaps triggered by increased rates of heat generation as a result of bearing or lubrication degradation. 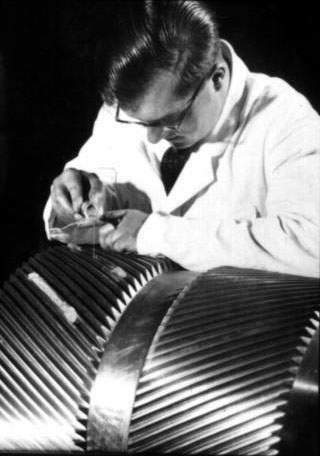 Resonant torsional vibrations and lateral vibrations always seem to come as a surprise, except in classes of machine such as turbine trains where they are analysed as a matter of course. Unfortunately, with the general trend in machinery to higher power, higher speeds, and higher stresses, the probability of resonant vibration occurring is ever increasing. Analysis is in principle fairly simple, if all the relevant masses, inertias and stiffnesses are known. For components such as motors, driveshafts and flexible couplings, these data are either given or easy to calculate. However, for gearboxes, the same cannot be said. Attempts to theoretically analyse the torsional stiffness are fraught, and measurements are greatly preferred. If the system designer is to be able to analyse the torsional and lateral vibration frequencies, he/she needs data from the gearbox manufacturers. Additional complications arise in the calculation of mounting and supporting structure stiffnesses, which also affect the natural frequencies. If torsional vibration is suspected, it is usually necessary to instrument a driveshaft or gearbox shaft and measure it. This is because the magnitude of the vibration is strongly dependent on the damping, to the extent that a system operating at resonance may have torque fluctuations of only a few percent, due to inherently good damping. Lateral critical speeds (shaft whirling) have occurred on some occasions purely from the mass of a flexible coupling or fluid coupling mounted on the gearbox input shaft. This is relatively easy to analyse if the gearbox internal arrangements are known. Unexpected torques and forces can occur for a multitude of reasons. A few of general interest are mentioned here. Flexible couplings, especially gear couplings, can exert substantial axial and radial loads, sufficient in some cases to fail bearings or to damage gears. Axial forces occur when the coupling is worn, with steps in the teeth. Bending moments and radial forces arise from the friction forces between the coupling teeth when operating normally. 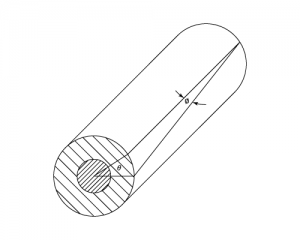 Cardan shafts (with universal joints) operating at large angles, 5° or more, cause pulsating bending moments at 2 x shaft frequency, which can excite lateral resonances on the cardan shaft, or other resonances in the system. Over-sized electric motors, which are frequently specified, can give excessive starting torques, and can also change the system resonant characteristics. Even with controlled soft-start characteristics, over-sized motors are dangerous; the operators may re-program the soft-start system to improve performance. Locked in torques can occur with multiple path drive systems. Those who have driven a 4-wheel drive vehicle on tarmac with the front-rear differential locked will know about this phenomenon. It has been known to shear gear teeth on mono-motor bogies (one motor driving 2 axles). Shaft torsional deflections on multiple path systems can result in the torque being mal-distributed between the paths. On one design of crank press, these deflections led to one pair of gears carrying 75% of the torque, instead of the intended 50%. It is difficult to separate these categories, which account for at least 25% of failures. The lubricant viscosity is rarely critical to within one ISO grade. However, there have been some cases where too low a viscosity lubricant has led to disaster. Therefore if there is a choice, or an ambiguity, it is usually best to err on the side of high viscosity. The type of lubricant is more important, with some gears and gearboxes requiring E.P. lubricants in order to survive. Any gears with high degrees of sliding, eg. 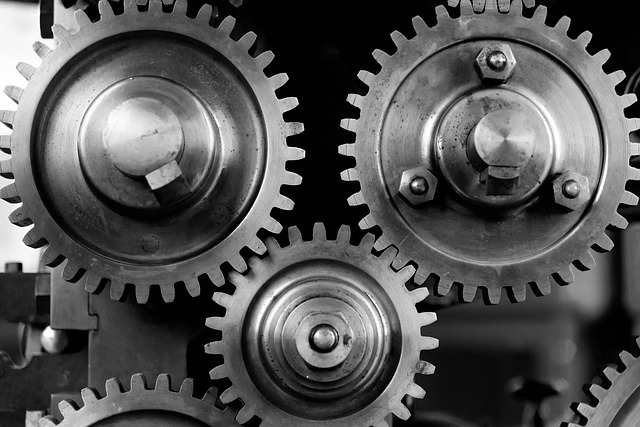 hypoid gears, are particularly critical. Most horizontal shaft gearboxes are satisfactorily splash lubricated. 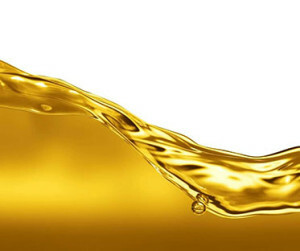 Conventional speed limits for the use of splash lubrication can be exceeded by a factor of 2 or even 4 with careful development of guides and deflectors to distribute and circulate the oil correctly. Vertical shaft systems however usually need a pump and circulation system to feed the upper bearings and gears. Problems which typically occur with these are failure to prime the pump, debris clogging the pump and filter (if fitted), and maldistribution of oil between the various bearings. If there is any possible doubt regarding the direction of rotation in service, then a bi-directional pump should be used. Excessive churning from large, high speed gears immersed in the oil, can result in excessive temperatures. This usually only applies to the higher speed shafts. Breathers and vents are a problem area, particularly for outdoor duty. Falling temperatures at night or due to rainfall inevitably cause moist air to be sucked in through the breather. Unless electric heaters are fitted, frictional heat generation is unlikely to give high enough temperatures to evaporate all water, so the lubricant becomes contaminated. Bearings in particular can suffer premature failures caused by quite small percentages of water. To avoid this, sealed gearboxes with expansion bladders are desirable. Intermittent operation, with periods of weeks or months between runs, is often blamed for failures. Unless there is evidence of water contamination, or damage from vibration while stationary, it is difficult to see why intermittent operation should necessarily be a problem. However, if the manufacturer’s instructions suggest the units be run at certain intervals, it is obviously wise to comply. Sealing is an area where little attention is paid, because in the majority of cases, simple lip seals to retain oil and exclude contaminants are adequate. However, in outdoor or corrosive environments, corrosion of the running surface of the shaft under the seal can soon render the seals useless. For such applications it may be necessary to specify a corrosion resistant sleeve (stainless steel or similar) on the shaft. It should also be noted that lip seals can sometimes have a pumping effect, either pumping contaminants into the gearbox, or pumping lubricant out. In gearboxes and gear systems, problems occur at least as frequently with the bearings as with the gears. Problems occurring within a gearbox (e.g. lubrication, shaft deflections, thermal instability etc.) are fundamentally the responsibility of the gearbox supplier, although external forces and moments applied to the gearbox need to be known. This requires discussion between gearbox supplier and system designer. Modern gear systems are in general very reliable. Attention paid to the types of failure modes discussed in this paper should result in even greater reliability.